A compost bin is a very helpful thing to have around in your home especially if you have a garden. It is a very cost-effective way of helping maintain your garden because through its use you can actually make compost which is laden with nutrients that your plants can utilize in order to grow healthy and beautiful. A lot of people have gone into the habit of making their own compost in order to save money from buying fertilizers instead. Composting is basically like recycling. However, before making your own compost you also have to plan for the compost bin that you are going to use. A wire mesh compost bin is just one of the compost bins you can make at home. It is easy to make a wire mesh compost bin. Furthermore, it is not even expensive to make one. You can even do it on your own. Before making one though it is best to consider if a wire mesh compost bin is indeed appropriate for use in your setting. You also have to consider the size of the garden where you will be using your compost. 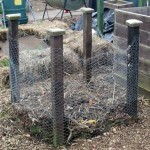 If it is a big area then you certainly do need to make a bigger wire mesh compost bin. The things that you will need in order to make a wire mesh compost bin are quite easy to find. You can simply go to the hardware store near you and get some poultry wire to serve as the mesh and some wooden stakes. Most poultry wires available are galvanized but there are also wire meshes that are made with stainless steel or coated with plastic. The tools that you will need in order to build the compost bin are just found in your garage so basically you are all set. Now that you have your materials, you have to find that spot in your garden where you are going to set up your wire mesh compost bin. A shady area is recommended because if sunlight is allowed to directly hit your compost, all the moisture will be dried out rendering it useless. You can either make a wire mesh compost bin in a circular form or a quadrilateral form. If it is a circle, then role the poultry wire into a circle with a diameter depending on the size you want. Before cutting give an allowance of at least 3 inches to look the edges together. Secure them with wires. Position it on the spot you want. On the inner portion place the stakes and make sure that they are sturdy so that your mesh does not get disturbed when accidentally bumped into. On the other hand, if you want your compost bin shaped like a square. Plant the stakes on each corner of the area where you want to create your compost bin. Then wrap the poultry wire around the four corner posts, tie and secure well. When it is time to turn you compost, you need to bring the pit down by simply removing the ties and the posts as well. Set up the whole thing again and replace back the compost. With a wire mesh compost bin you can actually make large volumes of compost.